The Shield Nickel began production in 1866. Mint Director James Pollock wanted an alloy of 75% copper and 25% nickel to replace the five-cent fractional currency note. The half dime was still around, but like other silver coins, had trouble staying in circulation. The Shield Nickel proved to be acceptable with the public. Mintages during 1879-1881 were very low because the Mint shifted resources in support of silver dollar production. In 1879, only 25,900 business strikes were issued, down nearly 90% from 1876 (only proof pieces were produced in 1877 and 1878). Interestingly, collectors of today are willing to pay considerably more for very high grade business strike 1879 Shield Nickels (MS-65 and higher) compared to their proof counterparts earning identical grade points. Apparently, few were saved in top pristine condition, relative to proofs. Among the proof population, there is a 9/8 overdate variety. The overdate carries no premium compared to the non-overdate 1879's, but it is worth mentioning: this is only one of two cases in the history of U.S. coinage where a proof overdate was generated by retooling a die from the previous year. The only other occurrence was the 1887/6 Three Cent Nickel. 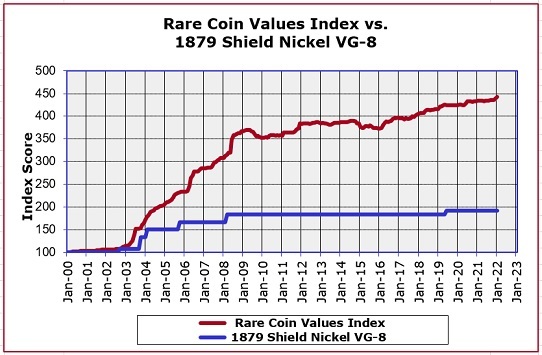 The 1879 Shield Nickel, blue line above, is one of 87 coins tracked in our Rare Coin Values Index. The Index score, graphed by the red line, is the overall score of the 87 coins combined. As you can see, the 1879 Shield Nickel rates below the Index performance. We gather data monthly to update the Index.